Christian Carvajal returns to Browsers Bookshop on Thursday, June 14 at 7:00 PM to promote his new book, C is for Collection. The twenty-one stories in C Is for Collection paint a portrait of their writer over a career spanning three decades of published material. Along the way, you’ll meet a child with a secret, a woman with six shots at revenge, a father and daughter reuniting, a silicon deity, a monster in medieval Paris and other fascinating characters from earth and beyond. 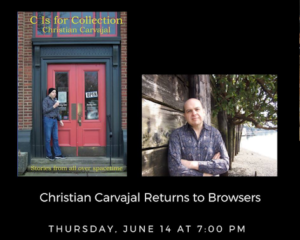 Christian Carvajal is the author of Lightfall, a satirical novel about the end of the world as seen from a small, Baptist town in Oklahoma. Mr. Klein’s Wild Ride, from Mud Flat Press, which he wrote as Lynn Savage, is set in a theme park for polyamorous adults. Carv is also the author of Rereading the Bible: Agnostic Insights Into Genesis, the Gospels and Revelation, a nonfiction look at scripture through 21st-century eyes. He is a frequent contributor to Creative Colloquy, OLY ARTS, and The Weekly Volcano.